Space truly is the final frontier. 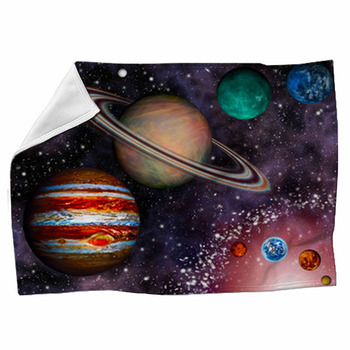 Dream of the day when you will see Earth from space with our stunning solar system blankets. 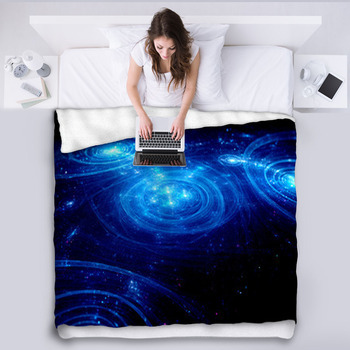 If you are looking for a new woven blanket, fleece blanket, or blanket throw in a solar system motif, you'll find dozens of fantastic options here. Since 2006 when astronomers officially defined a planet and moved Pluto to dwarf-planet status, our solar system consists of seven planets. Mercury, Mars, Earth, Venus, Jupiter, Saturn, Uranus, and Neptune and the sun. 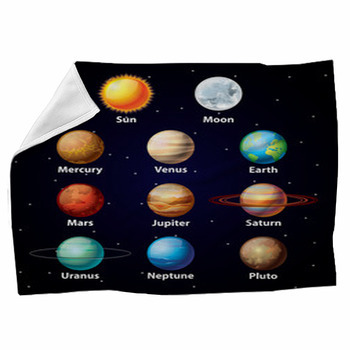 Our stunning blankets display all the planets in stunning colors, as well as a golden orange sun. 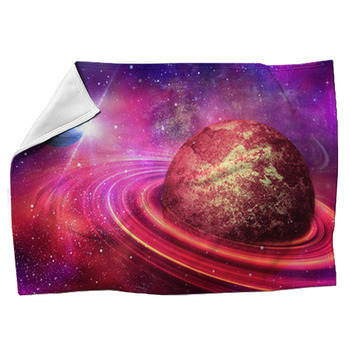 Although most of our solar system fleece blankets feature black backgrounds consistent with space, there are some designs with blue, golden brown, white, or purple backgrounds. 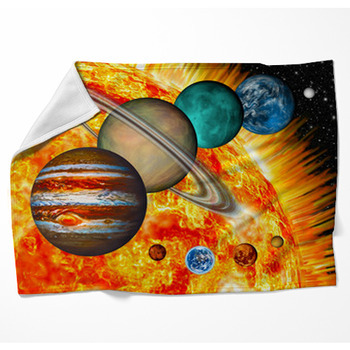 Others create motifs featuring solar systems in imaginary galaxies that have fantastic violet and orange backgrounds with planets in a wide variety of shades. 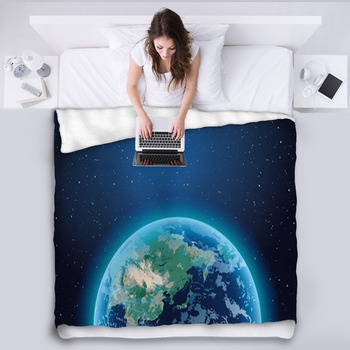 Use your woven blanket or fleece blanket in a solar system theme as the primary covering over your bed in the warmer months, especially if you don't like the heft of a comforter during summer. Or choose one of our blanket throws with gorgeous plants to drape over the arm of your favorite chair or even hang as art on your wall. 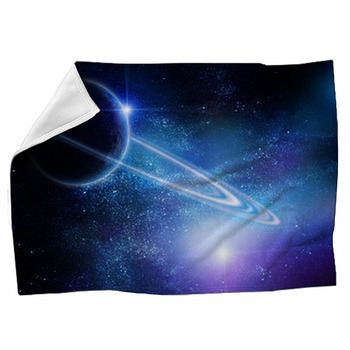 They make great gifts for your favorite sci-fi fan or astronomer. 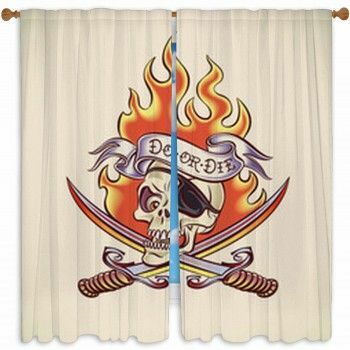 If you love the idea of decorating a room in an outer space, sci fi or solar system theme, consider checking out our corresponding rugs, shower curtains, bath towels, wall art, rugs, curtains, pillows and more. 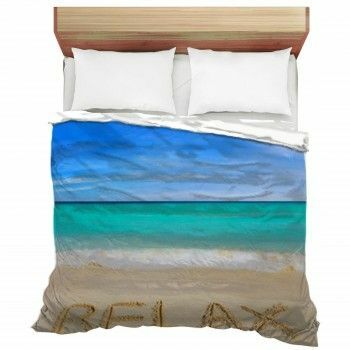 You'll find matching and complementary designs that will help you design a room that is out of this world!.